Mega Man 11 is a fine game, and a worthy eleventh entry in a series that once set the bar for tricky platformers. It also feels oddly shallow, the latest iteration of a formula that has gone largely unchanged for decades. Mega Man 11 is great at being a Mega Man game. Maybe that’s why it didn’t do much for me. The Mega Man formula, first established in 1987, has changed very little over the past 30 years. You play as a blue-armored robot who has to fight eight other, meaner robots. Each of those robots has their own theme, special power, and dedicated level full of enemies and pits. You can select those levels in any order, and once you’ve completed them all, you’ll play through a final gauntlet of obstacles and bosses en route to the final villain, the evil robot master Dr. Wily. Mega Man has picked up a few new abilities over the years. In Mega Man 3 he learned how to slide, and in Mega Man 4 he figured out how to charge up his shots to do more damage. Other than those tricks, however, very little has changed. What makes this series stand out is its clever and rarely imitated approach to upgrades: When you beat a robot, you’ll get its power, which you can then use throughout the rest of the game. Every boss is weak to one or two of those powers, and discovering their weaknesses is usually a matter of trial and error. Once you’ve got it, the boss is a cinch to destroy. 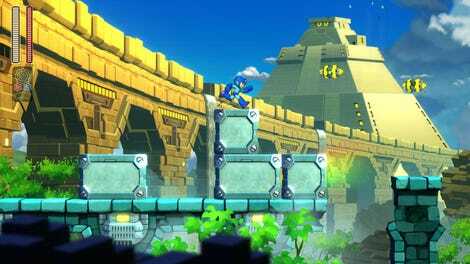 Mega Man 11 is the first Mega Man of this generation, and the long-awaited return of a series that was once the king of platformers. The thing is, platformers have gotten really, really good. From the hypnotic flow of Celeste to the thrilling exploration of Hollow Knight, the genre has evolved further than anyone could have imagined in the 80s or 90s. Shovel Knight, for example, builds on the fundamentals of Mega Man’s 2D action platforming and adds a rich story, an elaborate equipment system, and lots more. Celeste is a brilliantly interwoven piece of art, full of hidden challenges and clever twists on its core jumping mechanic. In contrast, Mega Man 11 feels basic, like it’s stuck in 1987 and hasn’t been able to adapt. The graphics might be sharper, and the levels might be laid out differently, but I still found myself running and gunning in the same ways I was in 1988’s Mega Man 2, fighting the same number of bosses, and the same final villain. The abilities Mega Man unlocks are fun, too. Destroy Block Man and you’ll be able to conjure blocks from thin air. Defeat Tundra Man and you can summon big vertical storms from either side of your body. There’s also a brand new system called Double Gear, which allows you to either slow down time or boost your strength for a temporary period. It’s a fun mechanic that saved me from more than a few deaths during some of Mega Man 11’s tougher boss fights. After playing through all eight stages followed by an underwhelming endgame gauntlet with couple of extra levels and bosses, I finished. It took me around three hours. I don’t feel like those hours were poorly spent, but I couldn’t help but think of how much more I’ve enjoyed other side-scrolling games I’ve recently played. Mega Man 11 feels like a relic, a rusted old robot that someone dug up and brought back to life without polishing off all the rough edges. In other words, Mega Man 11 is like Mega Man at the beginning of the game. It’s good at what it does, but it can only do one thing. 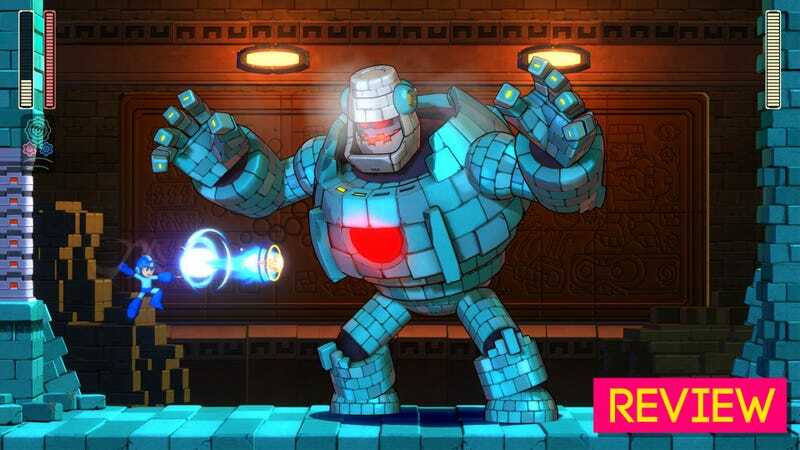 One of the bosses Mega Man fights this time around is called Block Man. As you’re fighting him, he’ll suddenly transform into a hulking monster that takes up most of the screen, swatting and punching at you constantly. It’s an unsuual moment, because Mega Man bosses don’t often transform. They follow specific patterns, and beating them is usually a matter of learning and conquering those patterns. I was briefly excited the first time I saw it, because it made me hope that the rest of the game would subvert my expectations in similar ways. Sadly, that didn’t happen. There were no other surprises in Mega Man 11, and although it’s a solid, well-made game, it ultimately left me unsatisfied.